Deb Griffin once owned these two very delightful Buchschmid and Gretaux pictures. 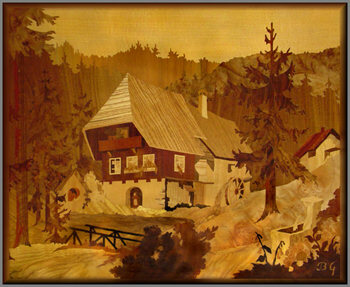 The upper most picture depicts a scene featuring a water mill house located in the picturesque German Black Forest. The lower two pictures feature a floral design, for which Buchschmid and Gretaux seem to have a particular talent. The B & G signature can be seen very prominently in the close up detail in the right hand photo. Although she loves these pictures dearly, Deb tells us that if anyone wishes to own them themselves, she is willing to discuss the matter with them. Please Note: These pictures have now been sold and are no longer available. We display them and the original text for information and educational purposes only. Just click the link to the right of these photos and we will pass your enquiries on to Deb. You can then discuss the matter with Deb on a one to one basis. Do note though, that the Marquetry Society does not act as an agent or dealer in any capacity whatsoever where such items are offered for sale by any of our contributors. We only mention such items when they form part of an article, as is this case. We cannot, and do not, accept responsibility for, or guarantee, the perceived, or real quality of the items described. Such information must be sought from the person offering the featured item for sale, NOT from the Marquetry Society. Dieter Becker, who resides in Germany, has contacted us with, what we consider could easily be, the definitive version of overall information concerning the Buchschmid and Gretaux Wood Inlay Company. Dieter was lucky enough to be a good personal friend of Mr Buchschmid and spent many happy (and enviable for us!) hours talking "marquetry talk" with him. As Dieter actually knew the founders and owners of the Buchschmid and Gretaux Company personally, it would therefore seem to be a logical assumption that Dieter's information should be viewed as probably the definitive description of the aforesaid company. Especially worth reading is the description of the Buchschmid and Gretaux working methods. We offer our thanks to Dieter for the in depth and highly detailed descriptions of the Buchschmid and Gretaux Company and the insight into the enthusiasm of Mr Buchschmid himself for his life long interest on the subject of marquetry and inlay work. Well done Dieter, thanks from us all. Vern Wilson recently got in contact to inform us that Buchschmid and Gretaux made beautiful "Book Ends" as well as their more familiar pictures. They also manufactured inlaid coffee tables into the bargain! Vern has, at least, 16 pieces of Buchschmid and Gretaux marquetry / inlay pictures and other various pieces! We think it would be fair to state that Vern is indeed one of those undoubted collectors of Buchschmid and Gretaux's work. Vern enjoys each and every one of those Buchschmid and Gretaux pieces every day. We have to say that we agree with Vern's view. Those Buchschmid and Gretaux marquetry / inlay pieces truly are superb examples of the genre. Wonderful work. The Buchschmid and Gretaux inlay company were located in the province of Stuttgart-Vaihingen, Germany. 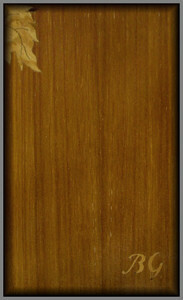 The company started its inlay marquetry picture production in the year of 1910. The founders of the company have both since passed away, Mr. W. Buchschmid in 2005 and Mr. Grétaux a few years earlier. The method they employed for producing their inlay pictures was, or is still known as, the Dekorpier method. The principal points of this method being; that a suitable line drawing of the chosen design is made at the outset. From this drawing various areas are marked out where veneer changes are required. This would be in a similar style to the marked out canvases supplied with those “Paint by Numbers” kits that were so very popular a few years ago. Each separate “marked out area” is then given an identification number. The individual numbered “areas” of the drawing are then cut out; for this process it was necessary to make at least two drawings so that a sufficient number of “templates” with “overlaps of the required area” became available. Each of these “templates” or “numbered area” drawings were then stuck on to a veneer pack of the corresponding veneer required for that particular section of the picture design. It was general practice to have around 20 or so veneer pieces in the pack. The pack was assembled with the “numbered area drawing” stuck onto the top veneer of the pack, the rest of the veneers in the pack being aligned for grain orientation and similarity of figuring and colour. This veneer pack is then taped together to prevent movement of the individual veneer layers, care being taken not to mask any of the drawing template on the top most veneer. When the “numbered area drawing” is eventually cut out from the “taped pack” by using a fret or piercing saw, it will be seen that the cutting operation will have now produced 20 identical veneer pieces that correspond with the original “template” or “numbered area”. Each of these “numbered area” pieces of sawn veneer are marked with their own particular reference number and then placed in a box with the rest of the other “numbered area” veneer pieces required for the final complete chosen picture. Once all the necessary pieces of veneer have been cut for the particular chosen picture, they are then assembled in their correct locations on yet another of the “template drawings”; this being in a similar manner to a jigsaw puzzle, but with the added advantage of having the design in place with each “numbered area” clearly identified, thus making it superbly simple to assemble the individual pieces of your puzzle. This assembled picture is then glued to a backing plate or board and finally sanded and varnished. The firm of Buchschmid and Grétaux made and sold many of their wood inlay pictures and pieces to railway companies and shipping lines for the purposes of decorating railway carriages and the state rooms and cabins of the passenger liners dating from the early years of the 20th Century. Their wood inlay pictures were sold worldwide, they were particularly popular on the American market, the subjects chosen for the pictures being especially appealing to those with family connections in the “Old World”. Our contributor, Mr Dieter, was a personal friend of Mr Buchschmid in the 1980’s and he got to know the old gentleman very well. He tells us that Mr Buchschmid was a most pleasant person and was always ready to impart his knowledge and wisdom whenever asked. In those latter years Mr Buchschmid would allow interested enthusiasts to purchase veneers from his own extensive stocks of prized veneers. Apparently, his workshop, garage and massive cellar were crammed to bursting point with veneer packages containing some of the most wonderfully figured and colourful veneers you are ever likely to see. It was a veritable land of milk and honey for any wood enthusiast! Mr Dieter was in that most enviable of positions of being able to buy selected veneers that were perfectly seasoned and aged, and that, any one of us, these days, would give their proverbial “right arm for”! Alas, for Mr Dieter, his financial resources didn’t run to purchasing vast amounts of those wonderful veneers. It is always a shame, in hindsight, that we never seem to be able to take advantage of the moment, when undoubted “golden offers” are made to us, that we don’t have the resources, or perhaps foresight, to seize that moment to, in this case, wonderfully enrich our own personal veneer stocks. Mr Dieter had many long and interesting conversations with Mr Buchschmid, but, as he says, he unfortunately didn’t document or record his anecdotes, experiences and knowledge, which were legion in the realms of inlay work and marquetry. As is always the case with virtually all of us, Mr Dieter visited Mr Buchschmid whenever he could, but unfortunately time itself and Mr Buchschmid’s age and eventual passing curtailed any more conversations with that kind old gentleman. This is a shame because, it would have been really interesting to have heard a recording of Mr Buchschmid himself speaking on the topic he knew so well of wood inlay and marquetry work. Mr Buchschmid’s nephew, Mr Veith, informs us that the estate of the Buchsmid and Grétaux Wood Inlay Company has been broken up and “scattered to the winds”. Mr Buchschmid’s vast veneer stock has all been sold. A few of the inlay pictures still remain, but that is all. The tools and machines that were used for producing all those wonderful pictures are no longer available, which is a terrible shame. Let’s hope that they have gone to a sympathetic home! All in all, it goes to show that the Buchschmid and Grétaux story helps in its own way to demonstrate that a quality produced product, such as those wood inlay pictures, is a quality that will last for decades, if not, centuries of years upon years. Click the above button to return to page 4 of "Can You Help"
Click the above button to visit page 6 of "Can You Help"